Black seed oil, also known as Nigella sativa oil and black cumin seed oil, is used to treat everything from asthma to digestion to cancer. But does black seed oil deserve the reputation that it has garnered? 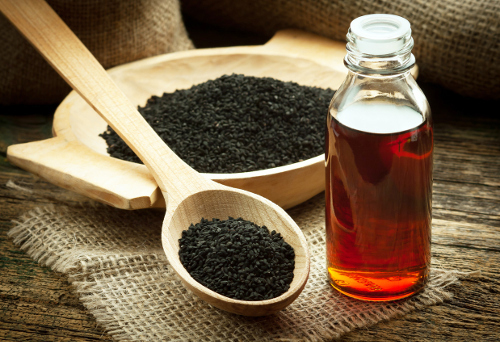 In this article, we are going to tackle everything you need to know about black seed oil. From black seed oil benefits, to side effects of black seed oil, to the black seed oil dosage you might need for these different benefits, by the time we are done, you should have a beginner’s guide to black seed oil. What is black seed oil? Where does it come from? Black seed oil comes from the seeds of the Nigella sativa plant. The plant is native to Asia, but has been cultivated in various places around the globe where the climate is right for it to flourish. As you might guess, with all of those nutrients, the potential benefits of black seed oil are pretty great. You may have heard that black cumin seed oil can cure everything. That’s not necessarily the case, but it could help you out with many different health issues. If you’ve done even a cursory reading of black seed oil articles, you’ve noticed that it has been linked with benefitting everything from your skin’s health to respiratory issues to cancer. But one little seed cannot help every single health problem you have, right? This is true, but black seed oil can help with a surprising amount of health issues. The following are just a few of the conditions that black seed oil may be able to assist you with. One of the problems that black seed oil has been used for centuries to help treat is indigestion. As it turns out, that’s right on the money as the seeds and the oil that comes from them are a natural carminative, a substance that helps with the excessive gas. In this case, black seed oil can help with bloating and may be able to relieve some symptoms of irritable bowel syndrome, like cramping and the spasms of the smooth muscle of the intestine wall. These same properties may also help you deal with nausea. There is a chance that black seed oil could aid you in efforts to lose weight. Black seed oil may help inhibit the absorption of sugar by the intestines, and thus can potentially help lower your blood sugar. This effect can make you feel full and help you eat less. As we previously mentioned, black seed oil can help inhibit the absorption of sugar by the intestines, which, in turn, could help lower your blood sugar. Not only is this great for helping with weight loss goals, but it might also help to manage diabetes. In addition to that, the Journal of Endocrinology and Metabolism reported that black cumin oil may stimulate the gradual partial regeneration of pancreatic beta-cells. This may result in increases of lowered serum insulin concentrations and decreases the elevated serum glucose. This can lead to the possible prevention of diabetes type I and also help increased insulin sensitivity in the liver cells which can help to prevent type II diabetes. Black seeds and black seed oil have been used for skin issues for years, supposedly dating back to the time of Cleopatra. This is partially due to two separate things that black seed oil could do for you. First, black seed oil contains thymoquinone, an anti-inflammatory component that can target some skin issues (like eczema, acne scar tissue, etc.) by helping to promote healing. Secondly, black seed oil may help to inhibit melanin production, which could prevent scarring. There’s a good chance that you’ve read somewhere that black seed oil may be able to help with issues stemming from cancer. While not the miracle cure that some articles make it out to be, there is some evidence that black seed oil may be able to help with colon, prostate, pancreatic and lung cancers. According to a 2012 study out of the National University of Singapore, black seed oil’s thymoquinone content may have the ability to help stop the growth of tumors from these particular cancers. Similar results were found in studies done in Saudi Arabia. The Singapore study also found that there is a good chance that using black seed oil in conjunction with regular chemotherapy may not only help the chemotherapy do its work, but may also lessen the side effects of the chemotherapy. You should discuss this with your doctor due to some other issues that may arise (see our side effects section). Remember those anti-inflammatory properties we mentioned with skin care? They might also reduce the inflammation in your respiratory system caused by allergies, and help relieve the inflammation that comes with asthma. There are a number of other possible health benefits, ranging from strengthening your hair to fighting fungal infections, linked to the goodness of black seed oil. But at the current moment, there isn’t much scientific evidence to explain why it works for these things. That being said, given all of the other benefits that do come with black seed oil, it might not hurt to give it a shot. After reading the many benefits of black seed oil, you may be wondering what kind of dosage you should be taking to reap all of the rewards it has to offer. The following is a rough guide on the amounts of black seed oil to use depending on the issues that you have. If these don’t seem to work, it may be a good idea to speak to a naturopath or a doctor to get more accurate amounts. Acne: Add one-half teaspoon of black seed oil to boiling water for a vaporizing treatment. Allergies: Try 40 to 80 milligrams per kilogram of black seed oil; three times daily for up to eight weeks. Colds: Take one teaspoon of black seed oil, three times daily. Cough: Rub one teaspoon of black seed oil onto your chest three times daily to relieve congestion. Diabetes: Consume 2.5 milliliters of black seed oil two times a day for six weeks in combination with your doctor’s current treatments for your diabetes. Diarrhea: Combine one cup of yogurt with one teaspoon of black seed oil, two times a day. Asthma: Take one teaspoon of black seed oil. Placing a few drops in boiling water and inhaling the vapors may also help. Sinusitis and acute sinusitis: Take one teaspoon of black seed oil daily for traditional sinusitis and one teaspoon of black seed oil three times daily for acute sinusitis. Stomach disorders: Take a teaspoon of black seed oil three times daily mixed with another liquid like mint tea or warm water. But before you go ahead with any of these treatments, you should be aware of the possible side effects and restrictions that come with black seed oil. Despite all the good it could do for your health, there are a few black seed oil side effects and restrictions that you should be aware of before going forward. If you are pregnant, do not take black seed oil, as it can smooth muscle contractions of the uterus. Hypotension is also a concern for those wanting to use black seed oil, since it can lower the blood pressure of those who already have low blood pressure or are taking medication for it. As with any natural health remedy, there is always the possibility of an allergic reaction, so keep an eye out for adverse effects. Finally, in regards to using black seed oil for cancer, discuss it with your doctor first. There is the potential for the remedy to interact badly with some cancer medications and reduce the medications’ effectiveness. Black Seed Oil May Benefit Your Health! As you can see, there may be side effects of black seed oil that you have to watch out for, but overall, the health benefits of black seed oil have fantastic potential for your health and well-being. If you are unsure, consult with a doctor or naturopath about black seed oil and whether it is good for your condition and health. Keep an eye out for allergic reactions and follow instructions, and you could be on the road to a healthier you thanks to black seed oil. Maier, K., “What is the Nutritional Value of Black Seed Oil?” Livestrong, September 2, 2015, http://www.livestrong.com/article/502091-black-seed-oil-cancer/, last accessed July 18, 2017. Nall, R., “The Health and Beauty Benefits of Black Seed Oil,” Healthline, June 22, 2017; http://www.healthline.com/health/food-nutrition/black-seed-oil-benefits#overview1, last accessed July 18, 2017. Severson, D., “Side Effects of Black Seed,” Livestrong, September 08, 2015; http://www.livestrong.com/article/120899-side-effects-black-seed/, last accessed July 18, 2017.